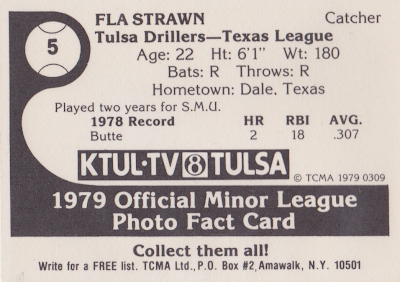 Cecil "Fla" Strawn turns 56 this Monday (July 30), about 35 years since he first played pro ball. This card's photo shows Fla at age 23, but he looks more seasoned thanks to a Tom Selleck mustache and ropey forearms. That year's Drillers team--named for Tulsa's long history with oil--played in the AA Texas League, an 8-team association that also included squads from Oklahoma, Louisiana, Mississippi, and Arkansas. Not sure who left that white bar on the photo, which could be stray editing tape on the working copy or an artifact from the original negative. Everything else matches TCMA's 1979 "yellow wave and white border" style (archive of similar posts). Fla spent three seasons in the Texas farm system, mostly in blue-collar towns Butte, Tulsa, and Tucson (career stats). These days, he works for Texas Lutheran University (sans mustache), and owned a fertilizer business at some point between (or alongside?) playing pro ball and coaching others with the same dream. TLU offers an email address, so I'll drop a line and see what Fla remembers about those years in the Midwest. 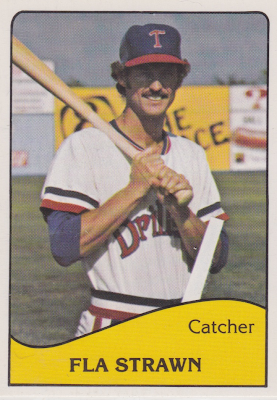 Erstwhile 1960s catcher Jim Schaffer managed Tulsa to a 58-75 finish in 1979. Their TCMA set includes 24 players, with no variations that I could find. UPDATE: Thanks to a visit from Tulsa team trainer Michael Donohue, we've learned that Bill Rollings and Roy Clark were team owners, cards below. 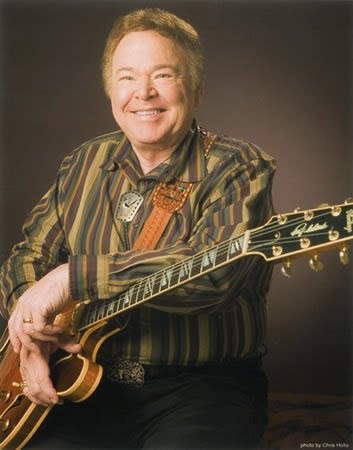 Roy Clark is the one-and-same musician and longtime host of Hee Haw. 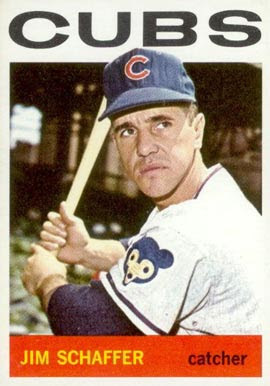 Photo from "10 Questions : Roy Clark"
Value: Fla cost $2 at MinorLeagueSingles.com and his teammates will run about the same. That's a nice card. I need to seek some of these out one day. The KTUL "8's the place" logo on the back field wall brings back a lot of memories. 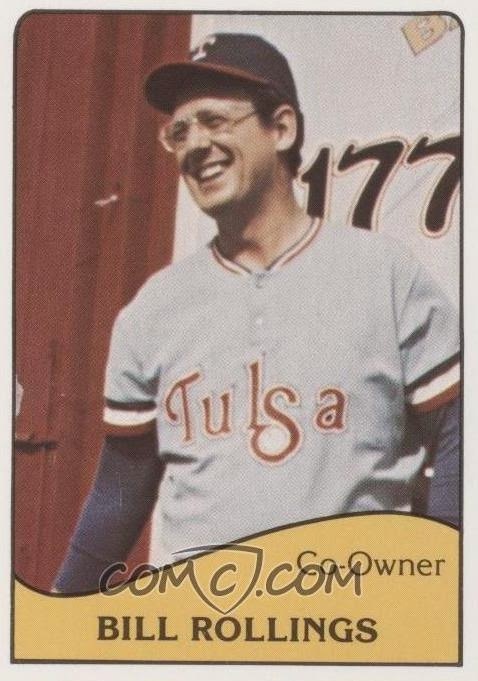 Nice, did you live in Tulsa in that card's 70s/80s era? Yeah, I lived in Tulsa in the late 70's, but moved to south east Oklahoma in 1980, but even so, the Tulsa channel was the only one with decent enough reception with those old antennae. 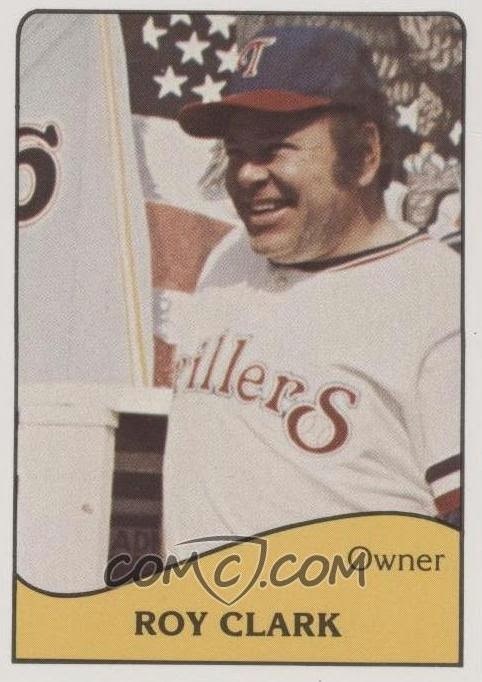 Bill Rollins and Roy Clark were the owners. Yes, that is the Roy Clark of Country Music fame. I was the trainer for the 1978 and 1979 teams. Thanks for the correction, Michael! I'll add those cards to the entry. Just in case, did you end up on a card during your Tulsa time?